Peter Parker (Maguire) was a shy, quite nerdy teenager...until he was bitten by a genetically altered spider. Now with the heightened senses and incredible strengths and abilities of a spider, Parker has become the amazing Spider-Man. The long awaited Spider-Man will be one of 2002`s biggest hits! A Conversation with Stan Lee - "An Appreciation: What Spiderman Means to Me"
Brillant Film with Fanatastic Extras. It even includes the Hero Music Video which was one of my favourite tunes of 2002. Behind the Scenes stuff goes really deep to show what went the making of the biggest film. The Making of Spiderman Comics was very cool to look at. Shame it doesn`t have DTS Sound but it is still a Top DVD. It is one of my Favourites. The entire world went to see a Spider-Man movie. I went to see a Sam Raimi movie. Go figure. I've never ever read a Spider-Man comic, but I vaguely remember watching the animated TV show and TV movies from the 80's as a kid. But who really needs to have studied their Spidey for this film. Spider-Man is such a famous icon, even your granny knows the basic plotline. Raimi directs the film with his usual flair and while he caters for the mainstream he gives his fans some stuff too. The olds mobile and Bruce Campbell. Yep Bruce was the "coolest" thing about the film. I hear he has a bigger role in the sequel. The story crackles along, with the origins of Spidey perfectly and affectionately handled. MaGuire and Dunst makes likeable leads and Dafoe hams it up hilariously as the Green Goblin. But it's J.K. Simmons who steals the show as Parker's boss. It is simply the funniest role of 2002 and if I thought it would bring some glory, I'd start a campaign for Best Supporting Actor for J.K. all by myself. Extras: The pack of the case takes forever to read and is misleading. 2 Commentaries on the first disc. Raimi is a fantastic commentator but he seems to have been waken up for this one. He slips in a few witty remarks, but this disc is primarily Dunst, Ziskin and the other guy. A nice listen but hardly great. The SFX commentary is a surprise and by a surprise I mean it isn't as achingly boring as most SFX commentaries. It's still boring though. The Trivia- Track is full of interesting stuff and worth your reading. Some featurettes in the form "Web-I-sodes" are spread out through the film. Using your title button smartly could prevent this tedium. Trailers and music videos round off disc 1. Disc 2: The comic book section is the better section. The Mythology of the 21st century is a fine is somewhat short documentary. It only feels like it's scraping the surface of something bigger. The movie documentaries are extended promo guff, with slight moments of humour. Watch when Raimi calls MaGuire "average looking". Funny! Video profiles for Raimi and Elfman are nice touches but I would have liked them to delve into their past films. Outtakes, comic character profiles and screen test round off the package. There is also an extensive DVD-ROM on both discs, which is why I've hired the rating to 8. Overall: One of the best summer films in ages. A servable transfer and pleasant if lacking extras. I can only assume this disc was packaged more for the young than cinefiles. An ULIMATE edition to come out? Maybe. I was told not to expect a lot from this movie, but still, I had *some* expectations, which weren`t that high. After watching it, though, I can honestly say, this is a bad movie. Talk about a stupid and childish plot, talk about characterless characters and talk about predictability. As if this wasn`t enough, Spiderman 2 is on its way. Oh, my. The video transfer is very good. The transfer reveals no compression signs and the colors are well saturated. However, quite a few CG scenes are too obvious and could`ve been done a lot better (from a CG point of view). The DD 5.1 soundtrack is good. The surrounds are nicely used, but the soundtrack could`ve been a lot more aggressive. The extras include: Disc 1 - 2 commentaries, information bubbles (MTV-like), 2 music videos and some DVD-ROM features (a comics book). Disc 2 - two behind the scenes featurettes, several screen tests, some outtakes, a picture gallery, a 3D gallery, tips for the computer game and some DVD-ROM features (a screen saver, skins and a game demo). Bottom line - despite the decent presentation on the disc, the movie doesn`t deliver the goods due to a total lack of a script. OK, so I`m a big Spider-man fan, so I`m going to be ever so slightly biased to the film, but it is a very enjoyable film, that really does nail the mythology. So it doesn`t follow the very first Spidey storyline, and it does deviate in other areas, but it doesn`t matter when it is this enjoyable. The direction is very good (and quite clearly Raimi), and the characters have been nailed across the board. Maguire really is Parker, and Dafoe is very good hamming it up as The Green Goblin. The best one is J Jonah Jameson. He is perfect in the movie. The visuals on the whole are excellent. The sets are very good, as are the costumes. It is let down in some areas by the CGI, which I will admit was bad in places, but the last shot promises much for the sequel. The film also probably suffers due to the re writing that was required after September 11th. Some of the added dialogue is very forced and corny because of this, and anyone who saw the fantastic teaser trailer will know what was promised and unfortunately had to be cut. A DTS track would have been nice, but the 5.1 is very good, with nice surrounds and good bass, and all the dialogue is clear. A bit hit and miss. The commentaries are OK, but a little dull, particularly the SFX teams one, as they usually are. the trivia track is quite nice though. Also on disc one are some trailers-but not the teaser- and then some music videos. I don`t really like Nickleback or Sum 41, but, if you do, nnnghh. Onto disc two, look at the comic book side first. This is fantastic, and gives a lot on what you need to know if you a newcomer, and has a nice documentary for truebelievers alike. There is also a look at the comics through the years, as well as a look at the hero and the villains and loves. Onto the movie section, and this is not so good. A couple of made for TV (HBO and E!) features don`t delve very deep and are nothing more than talking heads with some short behind the scenes shots. Also an OK blooper reel and some screentests, with the Maguire one being very odd. The ROM content is very good, with a demo of the good looking but hard to control PC game, and some comic books and other delights. Plot- A socially inept teen named Peter Parker gets bitten by some gentically mutated spider. He starts to gain incredible strengths and improved senses of a spider. He uses them to fight crime. Video- In 1.85:1 anamorphic widescreen. Colours are sharp and well defined. Slightly grainy in places but you need to focus on the picture. Extras- Disc 1, we have a commentary from Raimi and co. Another commentary from the SFX crew. They focus on the technical issues. A trivia track "Weaving The Web" is like Pulp Fiction or Jackie Brown trivia tracks. You have to be a quick reader as they appear in a flash. A follow the white rabbit Web-i-sodes. A wee spidey head will appear from time to time which lets you view small featurettes. Usual ingredients such as trailers and music vids. The DVD-ROM feature is fairly interesting, you can compare the comic book and feature as it plays. You can also record your own commentary from being abusive to boring. All you need is a microphone to start you off. Moving on to disc 2, the disc seems to be put into 2 parts. Focussing on the movie or the comic. In Goblin`s Lair, there is a short featurette HBO Making of Spider-man. This clocks in at 24 mins. Includes interviews with cast/crew. Spider-Mania: An E! Entertainment Special is another featurette. This clocks in at 40 mins. There are two short featurettes on the profiles of Raimi and Elfman. Both run for 7 mins. Next section is The Web of Spider-man. This focuses on the comic book. "Spider-Man: The Mythology Of The 21st Century". This is a documentary with interviews with Stan Lee and co talking about the birth of the comic book. "Spider-Man" comic book archives shows a gallery of old spider-man covers dating from 1963. Artist gallery show some drawings from the film. Rouge`s gallery shows profiles of enemies that `bothered`(understatement) spider-man. All presented in 3d form. The Loves of Peter Parker shows biographies of all the women in spidey`s life. 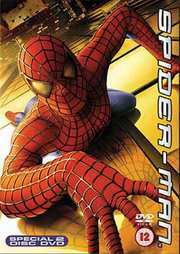 DVD-ROM content includes 3 Marvel comics, 2 level playable demo and a spider-man visualizer. Overall- A good film loaded with extras making this a worthy purchase. I do have some problems with Spider-man. As quoted by Jitendar Canth, Spider-man has "September 11th overtones" meaning drastic changes to the film after the terrorist attacks in NY. I don`t like that "We are still strong" or "feel good" attitude. It`s an insult to everyone. A darker ending would be better. Moving along, young children will like to have the Spider-man DVD in their collection.